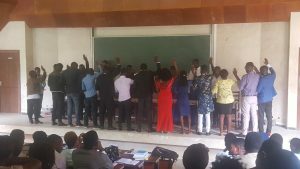 Lecturers in the Department of Political Science and Comparative Politics, under the Faculty of Laws and Political Science, of the University of Buea, UB, have called on students’ leaders of the department to epitomise leadership, so as to set an example for other departments and young people to follow. The call was made in UB, on January 15, in a ceremony to install newly elected Political Science Students’ Council of the University of Buea, POSSCUB. The ceremony was presided at, by Professor James Arrey Abangma, Head of Department for Political Science and Comparative Politics in UB. Welcoming students and staff to the ceremony, Mr John Wala Mua called on the students to hold the values of the department in high esteem so as to continue to be a shining light for other students to envy and follow. On his part, Prof. John Ndefru reminded students and the newly elected students’ executive that political science is the heartbeat of every society and community in the world. Talking on leadership, he beckoned them to epitomise good leadership, because good leadership skills are developed by leaders as they grow up and fit into the society. “You must be transparent and accountable. Tell the students how you use their money. The bad leadership you see in society today started at the micro level. You must grow up and be matured in the culture of accountability. Be exemplary and inspire other young people and draw them towards political science.” Prof. Ndefru said, furthering that the new executive should act like a good bridge between students and lecturers and as such, bring worries of students to the head o department who will oversee those issues affecting the students are duly handled, to assist them sail smoothly as they study in the department to obtain their desired degrees. The outgoing student government, headed by Emmanuel Oben, pledged its full support to the incoming executive, headed by Collins Tensa. The subsequent time I read a weblog, I hope that it doesnt disappoint me as a lot as this one. I imply, I know it was my option to read, however I truly thought youd have something attention-grabbing to say. All I hear is a bunch of whining about one thing that you can repair should you werent too busy searching for attention. Thank you so much for giving everyone an extremely brilliant opportunity to check tips from this website. It’s usually very good and full of fun for me and my office co-workers to visit your web site no less than three times weekly to see the fresh secrets you will have. And lastly, I’m certainly fulfilled for the splendid opinions you give. Selected 1 tips in this article are indeed the best I’ve ever had. I truly wanted to send a brief note to be able to thank you for some of the magnificent tips and tricks you are showing on this site. My long internet look up has finally been honored with extremely good content to go over with my company. I would mention that most of us visitors are very blessed to live in a superb place with so many awesome individuals with valuable things. I feel pretty grateful to have used your site and look forward to so many more fun times reading here. Thank you once more for all the details. Thanks for each of your hard work on this site. Kate loves managing investigation and it’s easy to understand why. Most people notice all concerning the dynamic medium you make vital steps through this blog and even improve response from website visitors about this content so our child is without a doubt understanding a great deal. Take advantage of the remaining portion of the new year. You are always performing a brilliant job. I and also my pals came viewing the great things located on your web page while unexpectedly I got a horrible feeling I never thanked the web blog owner for those secrets. All the people appeared to be certainly thrilled to see all of them and have actually been having fun with them. Appreciation for actually being quite considerate and also for deciding upon variety of impressive issues millions of individuals are really desperate to discover. My honest apologies for not expressing appreciation to sooner. I would like to show appreciation to this writer just for bailing me out of this type of setting. Just after surfing throughout the the net and getting recommendations that were not pleasant, I assumed my entire life was over. Living devoid of the solutions to the difficulties you have resolved by way of this posting is a serious case, as well as the kind which could have negatively affected my entire career if I hadn’t encountered the website. Your good expertise and kindness in controlling everything was excellent. I’m not sure what I would have done if I had not discovered such a thing like this. I’m able to at this point look ahead to my future. Thanks for your time so much for this impressive and result oriented guide. I won’t be reluctant to refer your web blog to any person who needs support on this subject matter. I have to point out my appreciation for your kindness in support of visitors who actually need help with that field. Your special commitment to passing the message around came to be really important and has really helped many people just like me to arrive at their targets. Your personal helpful key points implies so much to me and a whole lot more to my peers. Many thanks; from everyone of us. I’m writing to let you understand what a remarkable experience my friend’s princess undergone checking your blog. She even learned several details, which included what it’s like to have an amazing helping nature to make the mediocre ones without problems gain knowledge of specific specialized topics. You actually surpassed readers’ expected results. Thank you for delivering the insightful, trustworthy, educational not to mention unique guidance on that topic to Kate. I needed to create you a very little note in order to thank you very much as before for these remarkable guidelines you have discussed on this website. This has been really shockingly generous of people like you to deliver publicly what a lot of people could have sold as an ebook in making some cash for their own end, principally given that you could possibly have tried it if you desired. Those suggestions as well served to become fantastic way to be sure that most people have the identical passion like my own to know the truth great deal more in regard to this problem. I think there are several more pleasurable situations up front for those who examine your website. I must show my appreciation to the writer for bailing me out of such a predicament. Right after researching throughout the world wide web and seeing proposals which are not pleasant, I assumed my life was well over. Existing without the presence of solutions to the issues you have resolved by means of the guide is a critical case, and the ones that might have in a wrong way affected my entire career if I had not noticed the blog. Your primary training and kindness in taking care of a lot of stuff was priceless. I’m not sure what I would have done if I had not encountered such a thing like this. I can at this point look forward to my future. Thank you very much for your specialized and sensible help. I will not be reluctant to recommend your web blog to any individual who should have support about this subject. Thanks for your whole efforts on this website. My mum really loves managing investigations and it is simple to grasp why. Most people notice all concerning the compelling mode you create advantageous secrets by means of this web site and even foster response from other individuals on this area while our own daughter has always been discovering a lot. Have fun with the rest of the new year. Your doing a fantastic job. I wanted to type a simple note so as to appreciate you for the lovely information you are posting here. My rather long internet lookup has at the end of the day been honored with wonderful details to exchange with my good friends. I ‘d mention that many of us site visitors actually are undoubtedly blessed to dwell in a superb community with so many perfect individuals with useful solutions. I feel really grateful to have used the weblog and look forward to really more fun moments reading here. Thank you again for everything. A lot of thanks for your own hard work on this site. Kim really loves carrying out internet research and it is obvious why. Most people hear all of the dynamic method you present both useful and interesting tricks via your website and inspire contribution from some other people on the theme plus our favorite child has been being taught so much. Take advantage of the remaining portion of the new year. You are performing a great job. I enjoy you because of each of your hard work on this blog. My daughter loves conducting research and it’s obvious why. I hear all of the compelling means you provide very useful items via this web site and recommend contribution from others on the concept while my simple princess is certainly discovering a lot. Take advantage of the rest of the year. You have been performing a great job. I wish to show thanks to you for rescuing me from such a challenge. Right after searching throughout the the net and seeing suggestions which are not powerful, I was thinking my life was well over. Being alive devoid of the solutions to the problems you’ve resolved through your good review is a serious case, as well as the kind which might have in a wrong way affected my entire career if I had not encountered the blog. Your main competence and kindness in touching a lot of stuff was tremendous. I am not sure what I would’ve done if I hadn’t come across such a solution like this. I’m able to now look forward to my future. Thanks a lot very much for this expert and sensible guide. I won’t hesitate to propose your web sites to anybody who needs and wants guidance on this issue. I wanted to write you that little note to help thank you very much as before for your extraordinary secrets you have provided in this case. It’s quite tremendously generous with you in giving freely precisely what a lot of folks could possibly have distributed for an electronic book to help with making some dough for their own end, and in particular now that you could have done it in case you decided. Those strategies as well acted as the fantastic way to recognize that the rest have the identical interest just like my very own to know the truth very much more on the subject of this condition. Certainly there are many more fun periods up front for individuals who see your blog. I needed to compose you this very little word to be able to give thanks over again about the striking ideas you’ve shared above. This is quite pretty open-handed of people like you in giving freely all a few individuals would’ve advertised as an electronic book to help make some cash for themselves, principally considering that you could have done it if you considered necessary. Those tricks additionally worked as a good way to fully grasp that other individuals have a similar passion really like my very own to learn more when it comes to this condition. I’m certain there are millions of more pleasant moments in the future for those who check out your site. I together with my buddies were actually looking at the nice solutions on the website and then developed a horrible suspicion I never expressed respect to the site owner for those techniques. All of the ladies had been for this reason thrilled to learn them and have now undoubtedly been loving these things. Thank you for indeed being so accommodating and also for considering this sort of tremendous issues most people are really desperate to know about. My very own honest apologies for not expressing gratitude to you earlier. I wanted to jot down a simple remark in order to appreciate you for all the great ways you are showing here. My rather long internet search has at the end of the day been rewarded with excellent concept to write about with my co-workers. I would claim that we site visitors are undoubtedly lucky to live in a remarkable place with many wonderful individuals with valuable opinions. I feel quite fortunate to have encountered your entire webpage and look forward to plenty of more excellent times reading here. Thanks again for everything. Thanks a lot for giving everyone such a terrific chance to read from here. It’s usually very cool and also jam-packed with a great time for me personally and my office fellow workers to visit your website at minimum three times a week to study the latest things you will have. And definitely, I am certainly pleased considering the excellent tips you serve. Some two facts in this posting are undoubtedly the most suitable we have all ever had. Thanks so much for providing individuals with such a breathtaking opportunity to read articles and blog posts from this site. It is always very kind and packed with a lot of fun for me and my office acquaintances to search your blog on the least three times in one week to read through the newest guides you have. Of course, I am actually impressed with your beautiful concepts you give. Selected 4 points in this article are certainly the most beneficial I have had. I precisely wanted to thank you very much all over again. I am not sure what I could possibly have implemented without the opinions revealed by you regarding this concern. This has been a frightful case in my view, nevertheless being able to see a specialized tactic you dealt with it forced me to jump with contentment. I’m just grateful for the guidance and then believe you know what a great job you are putting in educating other individuals through the use of your websites. Probably you have never encountered all of us. I wanted to draft you a very little observation to finally thank you yet again just for the extraordinary tips you’ve documented on this website. It has been certainly extremely open-handed of you to supply unreservedly all that some people could possibly have made available as an ebook to earn some profit for themselves, even more so now that you could have tried it in the event you wanted. These concepts in addition acted to become a great way to comprehend someone else have the identical keenness just like my own to grasp more and more on the topic of this condition. I am certain there are millions of more pleasurable moments up front for individuals who scan through your site. I simply want to mention I am just new to blogs and certainly savored your blog. Probably I’m want to bookmark your blog post . You really come with fabulous writings. Cheers for sharing with us your web site. Thanks for all your hard work on this web site. Ellie really likes working on internet research and it’s really easy to understand why. My spouse and i know all relating to the lively form you create very useful information via this blog and therefore increase participation from some other people on that topic plus our own princess is always learning a whole lot. Take pleasure in the rest of the new year. You are performing a first class job. I must voice my respect for your kind-heartedness giving support to those people who absolutely need help with this one subject. Your special commitment to passing the message around became extraordinarily significant and have surely made those just like me to attain their pursuits. Your entire insightful advice implies a great deal to me and even further to my office workers. With thanks; from everyone of us. What i do not realize is if truth be told how you are not really much more smartly-appreciated than you may be right now. You’re so intelligent. You already know therefore considerably when it comes to this matter, produced me individually imagine it from a lot of various angles. Its like men and women don’t seem to be fascinated until it is one thing to accomplish with Woman gaga! Your own stuffs great. At all times take care of it up! you are in point of fact a just right webmaster. The web site loading speed is incredible. It kind of feels that you are doing any distinctive trick. In addition, The contents are masterpiece. you have performed a magnificent process on this topic! Whats Happening i’m new to this, I stumbled upon this I have found It absolutely helpful and it has helped me out loads. I hope to give a contribution & assist different customers like its helped me. Good job. I have to express my thanks to the writer for bailing me out of this type of condition. As a result of exploring through the world wide web and coming across ideas which were not helpful, I was thinking my life was over. Existing without the presence of approaches to the problems you’ve fixed all through your guideline is a critical case, as well as ones which could have badly damaged my career if I had not come across your website. Your personal knowledge and kindness in touching all the pieces was crucial. I am not sure what I would’ve done if I had not come upon such a thing like this. I’m able to at this time look forward to my future. Thank you very much for your professional and amazing guide. I will not think twice to recommend your blog to any person who needs and wants direction about this topic. I¡¦ve been exploring for a bit for any high-quality articles or weblog posts on this kind of space . Exploring in Yahoo I at last stumbled upon this website. Studying this information So i¡¦m happy to convey that I’ve an incredibly good uncanny feeling I came upon exactly what I needed. I so much without a doubt will make certain to don¡¦t fail to remember this web site and give it a look on a constant basis. Thank you for another fantastic post. Where else may just anyone get that kind of info in such a perfect approach of writing? I’ve a presentation next week, and I’m at the look for such info. Thanks so much for providing individuals with an extremely superb chance to read articles and blog posts from this site. It can be very superb and stuffed with amusement for me personally and my office fellow workers to visit your web site a minimum of three times per week to find out the new stuff you have got. And indeed, I am just at all times happy considering the attractive information you give. Certain 3 tips in this post are in reality the simplest we have had. Normally I don’t read article on blogs, however I would like to say that this write-up very pressured me to take a look at and do so! Your writing style has been surprised me. Thanks, very nice article. magnificent points altogether, you simply gained a emblem new reader. What may you recommend about your submit that you made a few days ago? Any positive? Hello there, I discovered your blog by means of Google even as searching for a comparable matter, your web site got here up, it looks good. I’ve bookmarked it in my google bookmarks. Thank you, I have recently been looking for info approximately this topic for a while and yours is the best I have came upon till now. However, what concerning the conclusion? Are you positive concerning the supply? I wish to get across my passion for your generosity supporting people that must have assistance with this important concern. Your special dedication to passing the message throughout had become really advantageous and have truly allowed men and women just like me to get to their dreams. This valuable guidelines can mean this much a person like me and even more to my peers. Thank you; from everyone of us. I just want to mention I am just all new to blogging and certainly enjoyed your web site. Almost certainly I’m likely to bookmark your blog post . You actually come with beneficial stories. With thanks for sharing your blog. Hi, Neat post. There is a problem along with your web site in internet explorer, might check this¡K IE nonetheless is the marketplace leader and a huge part of other people will miss your fantastic writing because of this problem. Hello there, You have done a fantastic job. I’ll definitely digg it and personally suggest to my friends. I am confident they’ll be benefited from this site. I would like to show some thanks to you just for bailing me out of such a scenario. Right after looking throughout the the web and obtaining opinions that were not beneficial, I was thinking my entire life was gone. Existing minus the strategies to the difficulties you have resolved by means of the guide is a critical case, as well as those that could have adversely affected my career if I hadn’t come across your blog post. Your training and kindness in controlling every item was priceless. I’m not sure what I would have done if I had not come upon such a thing like this. I’m able to at this point look ahead to my future. Thank you so much for this skilled and result oriented guide. I will not hesitate to refer your web page to any individual who requires tips on this subject matter. hey there and thank you for your info – I’ve definitely picked up anything new from right here. I did however expertise several technical points using this site, since I experienced to reload the web site a lot of times previous to I could get it to load correctly. I had been wondering if your hosting is OK? Not that I’m complaining, but slow loading instances times will often affect your placement in google and can damage your high quality score if ads and marketing with Adwords. Well I’m adding this RSS to my e-mail and could look out for a lot more of your respective interesting content. Make sure you update this again soon.. Thank you a bunch for sharing this with all folks you really understand what you’re talking approximately! Bookmarked. Kindly also consult with my website =). We can have a hyperlink alternate agreement among us! You really make it appear really easy with your presentation but I in finding this matter to be really one thing that I think I’d never understand. It seems too complicated and extremely large for me. I’m taking a look ahead on your subsequent publish, I will attempt to get the grasp of it! Thanks for your own hard work on this web page. Gloria take interest in participating in internet research and it’s obvious why. My spouse and i notice all concerning the compelling way you give valuable tricks by means of the website and therefore welcome participation from other individuals on that area of interest then our own child has always been being taught a whole lot. Enjoy the rest of the year. You are always doing a splendid job. I simply had to say thanks yet again. I’m not certain the things I would have undertaken without the actual hints shown by you on such a subject matter. It absolutely was a very frightening concern in my circumstances, nevertheless being able to view a new specialised way you solved the issue took me to leap with gladness. I am grateful for the help and then hope that you recognize what a powerful job you are undertaking instructing the mediocre ones all through your web page. I am certain you’ve never encountered any of us. Generally I don’t learn article on blogs, but I would like to say that this write-up very compelled me to take a look at and do it! Your writing taste has been amazed me. Thank you, quite nice post. of course like your web site but you have to test the spelling on several of your posts. Many of them are rife with spelling issues and I find it very troublesome to inform the truth however I¡¦ll surely come again again. I want to convey my appreciation for your kind-heartedness in support of folks who require help with that idea. Your very own commitment to passing the solution around had become extremely functional and have surely empowered people like me to reach their goals. Your amazing warm and friendly guide indicates much a person like me and extremely more to my office colleagues. Regards; from all of us. Thank you for every one of your work on this web site. My daughter takes pleasure in participating in investigations and it’s obvious why. We all hear all relating to the compelling ways you present powerful tactics via your blog and as well as attract participation from others on that issue and my girl is without a doubt starting to learn a great deal. Take advantage of the rest of the new year. You’re the one carrying out a tremendous job. naturally like your web-site but you have to test the spelling on several of your posts. A number of them are rife with spelling problems and I find it very troublesome to tell the reality nevertheless I will definitely come again again. Hiya, I’m really glad I have found this info. Nowadays bloggers publish just about gossip and net stuff and this is really annoying. A good site with interesting content, this is what I need. Thanks for making this web-site, and I’ll be visiting again. Do you do newsletters by email? Thank you for sharing excellent informations. Your website is so cool. I am impressed by the details that you¡¦ve on this website. It reveals how nicely you perceive this subject. Bookmarked this web page, will come back for more articles. You, my friend, ROCK! I found simply the info I already searched all over the place and just could not come across. What a perfect web-site. Great remarkable issues here. I am very happy to see your article. Thank you a lot and i’m looking forward to contact you. Will you please drop me a e-mail? magnificent submit, very informative. I ponder why the opposite specialists of this sector do not understand this. You must continue your writing. I’m sure, you’ve a great readers’ base already! Hi there. I discovered your site by means of Google at the same time as searching for a related matter, your web site came up. It appears great. I’ve bookmarked it in my google bookmarks to visit then. Hiya, I’m really glad I’ve found this information. Nowadays bloggers publish only about gossip and web stuff and this is really frustrating. A good blog with interesting content, that’s what I need. Thanks for making this web site, and I’ll be visiting again. Do you do newsletters by email? I¡¦m now not sure the place you are getting your information, but great topic. I must spend a while studying more or figuring out more. Thanks for excellent information I used to be searching for this info for my mission. Hiya, I am really glad I have found this information. Nowadays bloggers publish only about gossip and web stuff and this is really frustrating. A good website with exciting content, that’s what I need. Thank you for making this site, and I will be visiting again. Do you do newsletters by email? Hi there. I found your website via Google even as looking for a comparable matter, your website got here up. It looks great. I have bookmarked it in my google bookmarks to visit then. Someone necessarily lend a hand to make severely articles I would state. This is the first time I frequented your website page and to this point? I amazed with the research you made to create this actual submit extraordinary. Excellent activity! Wow, amazing weblog layout! How long have you been running a blog for? you make running a blog glance easy. The overall look of your website is fantastic, let alone the content! Hiya, I’m really glad I have found this information. Today bloggers publish just about gossip and internet stuff and this is actually annoying. A good blog with exciting content, this is what I need. Thanks for making this site, and I will be visiting again. Do you do newsletters by email? Hey there. I discovered your web site via Google at the same time as searching for a comparable matter, your web site came up. It seems good. I have bookmarked it in my google bookmarks to come back then. I would like to thank you for the efforts you’ve put in writing this blog. I am hoping the same high-grade web site post from you in the upcoming also. In fact your creative writing skills has inspired me to get my own website now. Actually the blogging is spreading its wings fast. Your write up is a great example of it. Great post. I was checking continuously this blog and I am impressed! Very useful information particularly the last part 🙂 I care for such info a lot. I was looking for this certain information for a very long time. Thank you and good luck. Hello there. I found your site by means of Google at the same time as searching for a similar matter, your site came up. It appears to be good. I’ve bookmarked it in my google bookmarks to come back then. Hey there. I found your website by the use of Google whilst looking for a related subject, your web site got here up. It seems good. I’ve bookmarked it in my google bookmarks to come back then. Hello there. I found your web site by way of Google even as looking for a comparable matter, your website got here up. It seems great. I have bookmarked it in my google bookmarks to come back then. Hey there. I discovered your website by means of Google even as looking for a related matter, your website came up. It looks good. I have bookmarked it in my google bookmarks to come back then. Hi, Neat post. There’s a problem along with your site in web explorer, may check this¡K IE still is the market leader and a huge element of other people will miss your wonderful writing because of this problem. Hey there. I found your web site by way of Google while looking for a comparable subject, your web site got here up. It appears great. I’ve bookmarked it in my google bookmarks to come back then. I¡¦m now not certain where you are getting your info, however good topic. I needs to spend a while learning much more or working out more. Thanks for wonderful info I was searching for this info for my mission. Hiya, I am really glad I have found this info. Nowadays bloggers publish only about gossip and net stuff and this is actually irritating. A good website with exciting content, that’s what I need. Thanks for making this site, and I’ll be visiting again. Do you do newsletters by email? Hi there. I discovered your web site by the use of Google whilst looking for a similar topic, your website got here up. It appears great. I have bookmarked it in my google bookmarks to come back then. Thank you, I’ve just been searching for info approximately this topic for a long time and yours is the best I’ve discovered so far. However, what concerning the bottom line? Are you sure about the source? Howdy very cool blog!! Man .. Excellent .. Amazing .. I will bookmark your web site and take the feeds also¡KI’m glad to search out numerous useful information here in the post, we want work out extra techniques in this regard, thank you for sharing. . . . . .
Hello there. I discovered your website by way of Google at the same time as searching for a similar topic, your website came up. It looks great. I have bookmarked it in my google bookmarks to come back then. Hi there. I found your site via Google at the same time as looking for a related subject, your web site got here up. It seems great. I’ve bookmarked it in my google bookmarks to visit then. I¡¦ve been exploring for a little for any high quality articles or weblog posts in this kind of house . Exploring in Yahoo I eventually stumbled upon this website. Reading this info So i¡¦m happy to express that I have a very just right uncanny feeling I came upon just what I needed. I such a lot without a doubt will make certain to do not forget this website and provides it a glance regularly. Hello there. I found your site by means of Google while searching for a related topic, your website came up. It seems good. I’ve bookmarked it in my google bookmarks to visit then. Hiya, I am really glad I’ve found this information. Nowadays bloggers publish just about gossip and internet stuff and this is actually irritating. A good blog with interesting content, that’s what I need. Thank you for making this website, and I’ll be visiting again. Do you do newsletters by email? Hiya, I’m really glad I’ve found this info. Today bloggers publish only about gossip and internet stuff and this is actually frustrating. A good blog with exciting content, that is what I need. Thanks for making this site, and I will be visiting again. Do you do newsletters by email? Hey there. I discovered your web site by way of Google whilst looking for a similar matter, your website came up. It appears great. I’ve bookmarked it in my google bookmarks to come back then. I was just looking for this information for some time. After 6 hours of continuous Googleing, at last I got it in your site. I wonder what’s the lack of Google strategy that don’t rank this kind of informative websites in top of the list. Normally the top sites are full of garbage. Hi there. I discovered your site via Google whilst looking for a comparable matter, your web site came up. It appears to be good. I’ve bookmarked it in my google bookmarks to visit then. Hiya, I’m really glad I have found this info. Today bloggers publish just about gossip and net stuff and this is actually frustrating. A good web site with exciting content, that’s what I need. Thank you for making this web site, and I will be visiting again. Do you do newsletters by email? Hello there, I discovered your blog by way of Google whilst looking for a comparable matter, your web site got here up, it appears to be like good. I’ve bookmarked it in my google bookmarks. hello!,I like your writing very so much! share we communicate extra approximately your post on AOL? I require an expert in this area to resolve my problem. Maybe that is you! Looking ahead to look you. Great ¡V I should certainly pronounce, impressed with your website. I had no trouble navigating through all tabs and related information ended up being truly easy to do to access. I recently found what I hoped for before you know it at all. Reasonably unusual. Is likely to appreciate it for those who add forums or something, web site theme . a tones way for your client to communicate. Nice task..
Hi there. I discovered your website via Google while searching for a related matter, your web site came up. It appears to be great. I have bookmarked it in my google bookmarks to visit then. Hi there. I discovered your website by the use of Google while looking for a related subject, your web site came up. It looks great. I’ve bookmarked it in my google bookmarks to visit then. Hi there. I found your blog via Google at the same time as looking for a similar matter, your web site got here up. It looks good. I’ve bookmarked it in my google bookmarks to come back then. Hello there. I discovered your site by the use of Google even as looking for a similar topic, your website got here up. It appears good. I have bookmarked it in my google bookmarks to come back then. Hiya, I am really glad I have found this information. Nowadays bloggers publish only about gossip and net stuff and this is actually annoying. A good site with interesting content, that’s what I need. Thanks for making this web site, and I will be visiting again. Do you do newsletters by email? Hello there. I discovered your site by way of Google while searching for a related topic, your web site came up. It looks good. I’ve bookmarked it in my google bookmarks to visit then. Thank you, I have just been looking for info approximately this topic for a long time and yours is the greatest I have found out till now. But, what in regards to the bottom line? Are you sure concerning the source? Hi there. I found your website by way of Google even as looking for a related subject, your site came up. It looks great. I have bookmarked it in my google bookmarks to visit then. I wish to express some appreciation to this writer for rescuing me from such a setting. As a result of checking throughout the world wide web and obtaining concepts which are not beneficial, I figured my entire life was done. Living minus the approaches to the issues you have solved as a result of your entire post is a serious case, and those which could have adversely affected my career if I had not encountered your website. Your own personal skills and kindness in maneuvering everything was helpful. I am not sure what I would’ve done if I had not discovered such a subject like this. It’s possible to at this point look forward to my future. Thanks for your time so much for your high quality and sensible guide. I will not be reluctant to recommend your web page to anybody who would need guidance on this issue. Hello there. I found your website by means of Google while looking for a similar topic, your web site got here up. It appears to be good. I’ve bookmarked it in my google bookmarks to visit then. Hey there. I found your blog by the use of Google whilst looking for a comparable topic, your site came up. It seems to be good. I have bookmarked it in my google bookmarks to visit then. Hello there. I found your blog via Google even as looking for a related matter, your website came up. It seems to be good. I’ve bookmarked it in my google bookmarks to visit then. Hi there. I found your web site by means of Google at the same time as looking for a related subject, your website came up. It seems good. I’ve bookmarked it in my google bookmarks to visit then. Hiya, I am really glad I have found this information. Nowadays bloggers publish just about gossip and web stuff and this is really frustrating. A good blog with interesting content, this is what I need. Thank you for making this site, and I will be visiting again. Do you do newsletters by email? Very well written story. It will be beneficial to everyone who utilizes it, as well as myself. Keep doing what you are doing – i will definitely read more posts. great issues altogether, you just gained a logo new reader. What would you recommend in regards to your submit that you made some days ago? Any sure? I do trust all of the ideas you’ve presented to your post. They’re very convincing and will definitely work. Still, the posts are too brief for beginners. Could you please extend them a little from subsequent time? Thank you for the post. Hi there. I found your website via Google at the same time as searching for a related matter, your website came up. It looks good. I have bookmarked it in my google bookmarks to visit then. Hi there. I discovered your website via Google whilst looking for a similar subject, your site got here up. It looks great. I have bookmarked it in my google bookmarks to visit then. Hi there. I found your website by means of Google whilst looking for a related topic, your website came up. It seems good. I’ve bookmarked it in my google bookmarks to come back then. Thank you a lot for sharing this with all of us you really know what you’re speaking approximately! Bookmarked. Kindly additionally discuss with my web site =). We could have a hyperlink alternate arrangement between us! Hey there. I found your blog by means of Google whilst looking for a comparable topic, your website came up. It appears to be great. I’ve bookmarked it in my google bookmarks to visit then. Hiya, I’m really glad I have found this information. Nowadays bloggers publish just about gossip and internet stuff and this is really frustrating. A good site with interesting content, this is what I need. Thanks for making this site, and I will be visiting again. Do you do newsletters by email? Hello there. I discovered your site by means of Google while looking for a similar matter, your web site got here up. It appears to be good. I have bookmarked it in my google bookmarks to come back then. Hiya, I am really glad I’ve found this info. Today bloggers publish only about gossip and net stuff and this is really frustrating. A good blog with interesting content, that’s what I need. Thank you for making this site, and I will be visiting again. Do you do newsletters by email? Hiya, I am really glad I’ve found this information. Today bloggers publish only about gossip and web stuff and this is really irritating. A good website with exciting content, this is what I need. Thank you for making this website, and I’ll be visiting again. Do you do newsletters by email? Thanks so much for providing individuals with remarkably spectacular chance to discover important secrets from here. It is always so fantastic and as well , full of fun for me and my office mates to search your website the equivalent of three times in a week to read the fresh stuff you have got. Not to mention, we’re always amazed concerning the astonishing thoughts you serve. Some 3 points in this article are surely the most suitable I’ve ever had. fantastic submit, very informative. I’m wondering why the other specialists of this sector do not notice this. You must continue your writing. I am confident, you have a great readers’ base already! Magnificent web site. Lots of helpful information here. I¡¦m sending it to some pals ans also sharing in delicious. And of course, thanks to your effort! Hello, Neat post. There’s a problem with your web site in internet explorer, may test this¡K IE still is the market leader and a large element of folks will omit your great writing due to this problem. Hey there. I discovered your blog by the use of Google even as searching for a related subject, your site came up. It appears good. I’ve bookmarked it in my google bookmarks to visit then. A person necessarily lend a hand to make significantly posts I would state. This is the very first time I frequented your website page and so far? I surprised with the analysis you made to create this particular put up amazing. Fantastic process! I simply want to say I am just all new to blogging and site-building and absolutely enjoyed this web-site. Most likely I’m likely to bookmark your blog post . You actually come with superb articles. Cheers for sharing your website. Hiya, I’m really glad I’ve found this info. Nowadays bloggers publish only about gossip and net stuff and this is actually annoying. A good web site with exciting content, this is what I need. Thank you for making this web-site, and I will be visiting again. Do you do newsletters by email? I have been browsing online greater than 3 hours lately, yet I by no means discovered any interesting article like yours. It¡¦s pretty value sufficient for me. In my view, if all webmasters and bloggers made good content as you did, the internet will likely be much more useful than ever before. Hey there. I discovered your web site by the use of Google whilst searching for a similar topic, your web site came up. It seems good. I’ve bookmarked it in my google bookmarks to come back then. Whats Happening i’m new to this, I stumbled upon this I’ve discovered It positively useful and it has helped me out loads. I hope to contribute & help other customers like its helped me. Good job. I happen to be writing to let you understand of the fabulous experience my child went through reading through your web site. She learned plenty of details, with the inclusion of how it is like to possess an excellent teaching character to make many others quite simply fully understand various tortuous subject matter. You actually exceeded our expected results. Many thanks for displaying those priceless, healthy, revealing and also easy guidance on your topic to Jane. certainly like your web site but you need to take a look at the spelling on quite a few of your posts. A number of them are rife with spelling issues and I to find it very bothersome to inform the truth then again I will certainly come again again. I happen to be commenting to let you know what a incredible discovery my cousin’s child experienced reading your web page. She realized a good number of issues, most notably what it is like to possess an awesome helping mood to get many more really easily grasp specified impossible things. You truly exceeded our desires. Thank you for offering these useful, trusted, revealing and unique guidance on the topic to Emily. Hiya, I’m really glad I’ve found this info. Today bloggers publish only about gossip and internet stuff and this is really irritating. A good blog with exciting content, this is what I need. Thanks for making this site, and I’ll be visiting again. Do you do newsletters by email? Hiya, I am really glad I’ve found this info. Nowadays bloggers publish just about gossip and internet stuff and this is really irritating. A good web site with interesting content, that is what I need. Thank you for making this site, and I’ll be visiting again. Do you do newsletters by email? Hiya, I’m really glad I have found this information. Nowadays bloggers publish just about gossip and internet stuff and this is actually frustrating. A good blog with interesting content, this is what I need. Thanks for making this website, and I’ll be visiting again. Do you do newsletters by email? Hello there. I discovered your site by means of Google whilst looking for a comparable topic, your web site came up. It seems great. I have bookmarked it in my google bookmarks to visit then. Hiya, I’m really glad I’ve found this info. Today bloggers publish just about gossip and internet stuff and this is really annoying. A good site with exciting content, that’s what I need. Thanks for making this site, and I’ll be visiting again. Do you do newsletters by email? Hey there. I found your website by the use of Google even as looking for a comparable subject, your website came up. It seems to be good. I’ve bookmarked it in my google bookmarks to visit then. Hiya, I’m really glad I’ve found this info. Today bloggers publish only about gossip and internet stuff and this is actually frustrating. A good web site with exciting content, this is what I need. Thanks for making this website, and I will be visiting again. Do you do newsletters by email? Hello there. I discovered your website by the use of Google while searching for a comparable subject, your web site got here up. It seems to be great. I have bookmarked it in my google bookmarks to come back then. Hey there. I discovered your site by the use of Google while searching for a related matter, your site got here up. It looks good. I’ve bookmarked it in my google bookmarks to come back then. Hi there. I found your blog via Google at the same time as searching for a similar matter, your site came up. It seems to be great. I’ve bookmarked it in my google bookmarks to come back then. Hi there. I discovered your web site by the use of Google at the same time as searching for a related matter, your site came up. It appears to be great. I have bookmarked it in my google bookmarks to visit then. Hey there. I found your website by means of Google even as searching for a similar subject, your website came up. It appears great. I’ve bookmarked it in my google bookmarks to visit then. Hello there. I found your web site via Google whilst looking for a related matter, your site got here up. It appears to be great. I have bookmarked it in my google bookmarks to visit then. Somebody essentially lend a hand to make significantly posts I’d state. That is the first time I frequented your website page and thus far? I surprised with the analysis you made to create this particular submit incredible. Excellent task! I will right away grab your rss feed as I can not to find your email subscription hyperlink or e-newsletter service. Do you have any? Please let me recognize in order that I could subscribe. Thanks. Hiya, I’m really glad I’ve found this information. Today bloggers publish only about gossip and internet stuff and this is really annoying. A good site with exciting content, this is what I need. Thank you for making this site, and I’ll be visiting again. Do you do newsletters by email? Hey there. I discovered your blog by way of Google even as searching for a related matter, your website got here up. It seems to be good. I have bookmarked it in my google bookmarks to come back then. Hi there. I found your web site by way of Google whilst looking for a related matter, your site came up. It appears to be great. I’ve bookmarked it in my google bookmarks to come back then. Hiya, I’m really glad I have found this info. Today bloggers publish only about gossip and net stuff and this is really irritating. A good website with exciting content, that is what I need. Thanks for making this website, and I will be visiting again. Do you do newsletters by email? Hi there. I found your blog via Google while looking for a related subject, your site got here up. It seems to be good. I have bookmarked it in my google bookmarks to visit then. Hi there. I found your site by way of Google while looking for a similar matter, your site came up. It seems to be great. I’ve bookmarked it in my google bookmarks to come back then. Hello there. I discovered your web site by way of Google while searching for a comparable topic, your website got here up. It looks good. I have bookmarked it in my google bookmarks to come back then. Hiya, I am really glad I’ve found this info. Nowadays bloggers publish only about gossip and net stuff and this is really annoying. A good web site with exciting content, that’s what I need. Thank you for making this site, and I’ll be visiting again. Do you do newsletters by email? Hey there. I discovered your blog by means of Google even as looking for a similar topic, your website got here up. It seems to be great. I have bookmarked it in my google bookmarks to visit then. Hiya, I am really glad I’ve found this information. Today bloggers publish only about gossip and internet stuff and this is really irritating. A good site with exciting content, that is what I need. Thank you for making this web-site, and I’ll be visiting again. Do you do newsletters by email? Hi there. I found your website by the use of Google while searching for a similar subject, your site got here up. It appears good. I’ve bookmarked it in my google bookmarks to visit then. Hey there. I found your web site by the use of Google even as looking for a related subject, your web site came up. It seems great. I’ve bookmarked it in my google bookmarks to come back then. Hello there. I discovered your website by the use of Google even as searching for a related topic, your web site got here up. It seems good. I’ve bookmarked it in my google bookmarks to come back then. Hi there. I discovered your web site by way of Google at the same time as searching for a similar topic, your web site came up. It seems good. I have bookmarked it in my google bookmarks to visit then. Whats Happening i am new to this, I stumbled upon this I’ve discovered It positively helpful and it has helped me out loads. I’m hoping to give a contribution & assist other users like its helped me. Great job. Hiya, I am really glad I have found this information. Nowadays bloggers publish only about gossip and net stuff and this is actually irritating. A good blog with interesting content, this is what I need. Thank you for making this site, and I’ll be visiting again. Do you do newsletters by email? Hiya, I am really glad I’ve found this info. Today bloggers publish just about gossip and web stuff and this is really irritating. A good website with interesting content, this is what I need. Thanks for making this web site, and I will be visiting again. Do you do newsletters by email? Hi there. I found your website by the use of Google while searching for a similar matter, your web site got here up. It appears to be good. I’ve bookmarked it in my google bookmarks to visit then. Hiya, I am really glad I’ve found this information. Today bloggers publish just about gossip and net stuff and this is really irritating. A good blog with exciting content, that is what I need. Thank you for making this website, and I’ll be visiting again. Do you do newsletters by email? Hiya, I am really glad I’ve found this info. Today bloggers publish only about gossip and web stuff and this is really irritating. A good web site with exciting content, this is what I need. Thank you for making this website, and I will be visiting again. Do you do newsletters by email? Hello there. I found your website by way of Google while searching for a comparable subject, your site came up. It seems to be good. I have bookmarked it in my google bookmarks to visit then. Hiya, I’m really glad I have found this info. Nowadays bloggers publish only about gossip and web stuff and this is actually frustrating. A good site with interesting content, that’s what I need. Thank you for making this website, and I will be visiting again. Do you do newsletters by email? Hi there. I found your site by means of Google whilst looking for a related topic, your website came up. It appears to be good. I have bookmarked it in my google bookmarks to come back then. Hi there. I found your web site by means of Google whilst looking for a comparable subject, your web site came up. It appears to be good. I’ve bookmarked it in my google bookmarks to visit then. Hey there. I found your site by way of Google even as looking for a related subject, your web site came up. It seems to be great. I’ve bookmarked it in my google bookmarks to come back then. Hiya, I’m really glad I have found this information. Nowadays bloggers publish just about gossip and web stuff and this is really frustrating. A good blog with interesting content, that’s what I need. Thanks for making this site, and I’ll be visiting again. Do you do newsletters by email? Hiya, I am really glad I have found this information. Today bloggers publish just about gossip and net stuff and this is actually irritating. A good site with exciting content, that is what I need. Thanks for making this site, and I’ll be visiting again. Do you do newsletters by email? Hello there. I found your site by way of Google at the same time as searching for a comparable topic, your website got here up. It seems good. I have bookmarked it in my google bookmarks to visit then. I¡¦m now not certain the place you are getting your information, but good topic. I must spend a while finding out more or working out more. Thank you for great information I was in search of this information for my mission. Hey there. I discovered your site by way of Google even as looking for a comparable topic, your website got here up. It seems to be great. I have bookmarked it in my google bookmarks to come back then. Hiya, I’m really glad I have found this information. Nowadays bloggers publish just about gossip and internet stuff and this is really frustrating. A good blog with exciting content, that is what I need. Thank you for making this web-site, and I will be visiting again. Do you do newsletters by email? Hi there. I found your website by way of Google while searching for a similar subject, your website got here up. It looks good. I have bookmarked it in my google bookmarks to visit then. Hello there. I discovered your blog by way of Google whilst looking for a comparable topic, your website came up. It looks great. I’ve bookmarked it in my google bookmarks to come back then. Hiya, I’m really glad I have found this info. Today bloggers publish just about gossip and internet stuff and this is really annoying. A good blog with exciting content, that is what I need. Thanks for making this web site, and I will be visiting again. Do you do newsletters by email? Hey there. I found your website by means of Google even as searching for a related matter, your site came up. It looks good. I’ve bookmarked it in my google bookmarks to come back then. Hiya, I am really glad I’ve found this information. Today bloggers publish just about gossip and internet stuff and this is actually annoying. A good site with interesting content, that is what I need. Thanks for making this site, and I’ll be visiting again. Do you do newsletters by email? Hiya, I’m really glad I have found this information. Nowadays bloggers publish only about gossip and internet stuff and this is really irritating. A good web site with interesting content, that is what I need. Thank you for making this web site, and I will be visiting again. Do you do newsletters by email? Hello there. I discovered your site via Google whilst looking for a similar matter, your web site got here up. It appears to be good. I’ve bookmarked it in my google bookmarks to come back then. Hello there. I discovered your website by means of Google even as looking for a comparable topic, your site came up. It seems to be great. I’ve bookmarked it in my google bookmarks to visit then. Hello there. I discovered your blog by the use of Google at the same time as searching for a similar matter, your website got here up. It appears great. I have bookmarked it in my google bookmarks to come back then. Hey there. I found your blog by means of Google even as looking for a similar topic, your site came up. It looks great. I’ve bookmarked it in my google bookmarks to come back then. Hey there. I found your blog by way of Google at the same time as searching for a related subject, your website got here up. It appears to be great. I’ve bookmarked it in my google bookmarks to come back then. Hello there. I discovered your blog by way of Google whilst looking for a related topic, your website came up. It appears great. I’ve bookmarked it in my google bookmarks to visit then. Hello there. I discovered your blog via Google while searching for a similar subject, your site came up. It appears good. I’ve bookmarked it in my google bookmarks to come back then. Hi there. I found your site by the use of Google whilst looking for a comparable matter, your website came up. It seems to be good. I have bookmarked it in my google bookmarks to come back then. I’m seeking apparel and also style concepts at a reasonable rates for a lady over 25 … Anybody recognize any type of good sites or blogs?. Feels like whatever I find is either tailored toward teenagers or is hugely pricey couture … Many thanks!. Hello there. I discovered your blog by way of Google whilst looking for a related subject, your website came up. It seems to be great. I’ve bookmarked it in my google bookmarks to come back then. I must express my admiration for your generosity supporting all those that need help on that field. Your special commitment to getting the solution throughout had become rather beneficial and has consistently permitted some individuals like me to attain their targets. Your entire interesting guidelines signifies a great deal a person like me and even more to my colleagues. Thank you; from each one of us. Hello there. I found your blog by way of Google even as looking for a related matter, your website came up. It seems good. I’ve bookmarked it in my google bookmarks to come back then. Hiya, I’m really glad I have found this information. Nowadays bloggers publish just about gossip and net stuff and this is really frustrating. A good web site with interesting content, this is what I need. Thank you for making this website, and I’ll be visiting again. Do you do newsletters by email? Hello there. I discovered your blog via Google while looking for a comparable matter, your website got here up. It seems good. I’ve bookmarked it in my google bookmarks to come back then. Hey there. I discovered your website by the use of Google while looking for a related matter, your site got here up. It looks great. I have bookmarked it in my google bookmarks to come back then. Hello there. I discovered your blog by means of Google even as looking for a comparable topic, your site got here up. It looks great. I have bookmarked it in my google bookmarks to come back then. Hello there. I discovered your site via Google while searching for a related matter, your website came up. It appears to be good. I’ve bookmarked it in my google bookmarks to come back then. Hello there. I found your site by the use of Google at the same time as looking for a comparable subject, your site got here up. It seems good. I’ve bookmarked it in my google bookmarks to visit then. Hiya, I am really glad I’ve found this info. Nowadays bloggers publish just about gossip and internet stuff and this is really annoying. A good web site with interesting content, this is what I need. Thanks for making this web-site, and I’ll be visiting again. Do you do newsletters by email? Hey there. I found your site by way of Google while looking for a related matter, your web site got here up. It seems to be great. I have bookmarked it in my google bookmarks to visit then. Hiya, I’m really glad I’ve found this info. Today bloggers publish only about gossip and web stuff and this is actually irritating. A good web site with interesting content, this is what I need. Thank you for making this web-site, and I will be visiting again. Do you do newsletters by email? Hey there. I discovered your website by means of Google while searching for a related subject, your website got here up. It seems to be great. I’ve bookmarked it in my google bookmarks to visit then. Hi there. I discovered your web site by means of Google even as looking for a comparable subject, your website came up. It seems to be good. I have bookmarked it in my google bookmarks to visit then. Hiya, I am really glad I have found this information. Nowadays bloggers publish only about gossip and net stuff and this is actually frustrating. A good web site with exciting content, that is what I need. Thanks for making this web site, and I will be visiting again. Do you do newsletters by email? Hello there. I discovered your site by means of Google at the same time as looking for a comparable matter, your site got here up. It looks great. I have bookmarked it in my google bookmarks to come back then. Hi there. I discovered your blog by means of Google at the same time as looking for a similar topic, your web site got here up. It appears good. I have bookmarked it in my google bookmarks to visit then. Hi there. I discovered your website by means of Google while searching for a related matter, your website got here up. It seems great. I have bookmarked it in my google bookmarks to visit then. Thanks a bunch for sharing this with all of us you actually recognize what you are speaking about! Bookmarked. Kindly additionally talk over with my web site =). We could have a hyperlink trade arrangement between us! Hiya, I am really glad I have found this info. Today bloggers publish only about gossip and net stuff and this is really annoying. A good site with interesting content, that’s what I need. Thanks for making this web site, and I will be visiting again. Do you do newsletters by email? Hi there. I found your web site by the use of Google even as looking for a similar matter, your website came up. It looks good. I’ve bookmarked it in my google bookmarks to come back then. Hiya, I am really glad I’ve found this info. Nowadays bloggers publish just about gossip and web stuff and this is really annoying. A good site with exciting content, that is what I need. Thank you for making this website, and I will be visiting again. Do you do newsletters by email? Hiya, I’m really glad I have found this info. Nowadays bloggers publish just about gossip and internet stuff and this is really frustrating. A good blog with interesting content, that’s what I need. Thanks for making this site, and I will be visiting again. Do you do newsletters by email? Hi there. I found your website via Google even as looking for a related matter, your website got here up. It seems to be great. I’ve bookmarked it in my google bookmarks to visit then. Hiya, I’m really glad I have found this info. Today bloggers publish only about gossip and web stuff and this is really frustrating. A good website with exciting content, that’s what I need. Thanks for making this web-site, and I will be visiting again. Do you do newsletters by email? Hiya, I’m really glad I’ve found this information. Nowadays bloggers publish only about gossip and internet stuff and this is actually frustrating. A good site with interesting content, that is what I need. Thank you for making this website, and I’ll be visiting again. Do you do newsletters by email? Hiya, I’m really glad I have found this info. Nowadays bloggers publish only about gossip and web stuff and this is really irritating. A good website with interesting content, that is what I need. Thank you for making this website, and I’ll be visiting again. Do you do newsletters by email? Hello there. I discovered your web site by way of Google even as looking for a similar matter, your site came up. It seems good. I’ve bookmarked it in my google bookmarks to visit then. Hello there. I found your site via Google while searching for a comparable matter, your website got here up. It appears great. I have bookmarked it in my google bookmarks to visit then. Hiya, I’m really glad I’ve found this info. Nowadays bloggers publish just about gossip and internet stuff and this is actually annoying. A good blog with exciting content, that is what I need. Thank you for making this web-site, and I will be visiting again. Do you do newsletters by email? Hiya, I am really glad I have found this information. Today bloggers publish only about gossip and internet stuff and this is really frustrating. A good website with interesting content, this is what I need. Thank you for making this web site, and I’ll be visiting again. Do you do newsletters by email? Hello there. I discovered your site by means of Google at the same time as looking for a comparable topic, your website came up. It appears great. I’ve bookmarked it in my google bookmarks to come back then. Hiya, I am really glad I’ve found this information. Today bloggers publish just about gossip and web stuff and this is really irritating. A good blog with interesting content, that is what I need. Thanks for making this site, and I’ll be visiting again. Do you do newsletters by email? Hi there. I found your web site by means of Google even as searching for a similar matter, your website came up. It appears to be good. I have bookmarked it in my google bookmarks to come back then. Hiya, I’m really glad I have found this information. Today bloggers publish just about gossip and web stuff and this is actually irritating. A good web site with interesting content, that’s what I need. Thanks for making this site, and I’ll be visiting again. Do you do newsletters by email? Hello there. I found your web site via Google at the same time as searching for a related subject, your site got here up. It looks great. I have bookmarked it in my google bookmarks to visit then. Hello there. I discovered your web site by the use of Google even as looking for a comparable subject, your web site came up. It seems good. I have bookmarked it in my google bookmarks to come back then.